It’s been a while and, oh how I’ve missed you so! Between selling our home, a quick move and a much longer renovation in the new loft, coupled with massive freelance jobs (for which I am grateful! ), I had very little time for social media so I was excited to take a needed vacation to Vietnam! I had always wanted to go yet the trip kept getting put off and this time, despite the fact that my partner was going to miss out, I took a chance and went on my own. I’m not a huge fan of tours preferring to travel sans the roving band of tourists but language restrictions dictated that I buddy up with a tour group. I chose Gate 1 which would allow me to see a large stretch of Vietnam and I could do as little or as much as I wanted with the tour. What I got in return was an excellent English speaking tour guide who helped us see his country through his eyes and experience the rich and ancient culture of Vietnam. As a developing country, the major cities are bursting with unchecked growth, tens of thousands of scooters and everyone has their hustle. Old and new, it’s all jammed together side by side like life on steroids. I started in Ho Chi Minh City also known as Saigon, on to Hội An and the beauty of Hạ Long Bay, Huế and finally, founded in 1010, the capital city of Hanoi. The legendary Rex Hotel whose rooftop bar was the favorite hangout for war correspondents. I couldn’t pass up the opportunity for cocktails! Vertical and green is one way to describe Saigon. Hot and humid is the other. The colonial style of the Post Office is the perfect example of French Colonialism. More evidence of French occupation in the shape of Saigon’s Notre Dame. The above picture is of the last helicopter leaving Saigon at the end of the Vietnam War. Following is the same apartment building as it stands now viewed from the back. Cute little cafes and shops are oasis of cool in the extreme hot, humid environs of Ho Chi Minh City. I had seen this tee shirt once or twice in Little Tokyo. It looks just like any of the shops found in Echo Park or Silver Lake. A visit to an amazing lacquer studio where these incredible works of art are made. 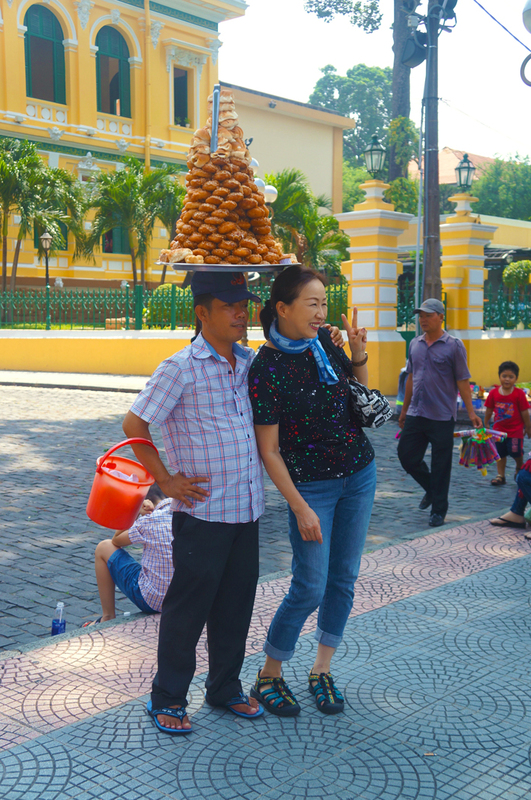 In my view, Ho Chi Minh City was probably the most modern and I wish I had spent more time getting to know it. Tomorrow we head out to Hoi An!